Following the start of Season 4, our dear Bushiroad has decided to release a new clan, called Gear Chronicle, which is used by our new main character, Chrono Shindou. For those of you familiar with Greek mythology, Chronos is the personification of time in pre-Socratic philosophy. If Bushi is trying to hint something, they certainly did a good job of it. [AUTO](VC): GB2(This ability is active when you have 2 or more face-up G units in your G Zone and/or VC) When this unit attacks a Vanguard, until end of that battle, this unit gets [Power}+5000, and your opponent cannot call Grade 1 or greater units to (GC). [AUTO](VC): [Counter Blast (1)] During your turn, when your G unit Stride, you may pay the cost. If you do, choose one of your opponent's rear-guards, and put that unit at the bottom of your opponent's deck. So this unit plays with the concept of "time", by sending rear-guards back to the deck, where they once were(in the past). The GB2 ability is pretty neat, considering by that time, the game would have shifted into late-game, and your opponent would need to guard almost every attack. Gear Chronicle's main mechanic focuses on sending their opponents' rear-guards back to the bottom of the deck. 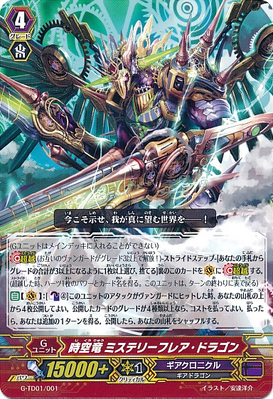 [AUTO](VC): [Counter Blast (4)] When this unit's attack hits a Vanguard, you may reveal the top 4 cards of your deck. If the revealed cards have 4 different grades or more, you may pay the cost. If you do, you get an additional turn. If you reveal, shuffle your deck. Welllll ok..... This seems rather OP at first glance, but the CB4 effect is REALLY hard to pull off in actual gameplay. If you do pull it off, the "extra turn" starts off with the stand-and-draw phase, and this unit would have gone back to the G Zone. That's not even a 1 % chance! So for those of you who think this will break the meta, think again. 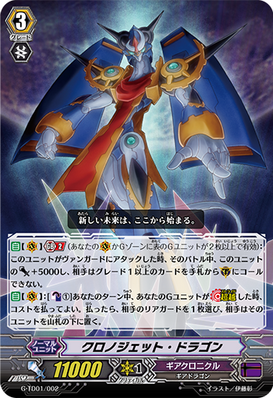 In this deck, Mystery Flare Dragon is replaced by Chronos Command Dragon, simply because the chances of Mystery Flare going off is too low, and Chronos Command is more consistent by putting on more pressure when he is on the (VC). Fatewheel Dragon is in a word, ANNOYING. While it uses alot of counterblasts, it certainly has a good reason to do so. Its main effect is a silent tom that gets a critical when attacking for just 1 counterblast. It just wastes all your negates away. So while one Vanguard has a glory effect, the other has a silent tom effect. Good job. Steam Fighter Amber is a core unit of this deck. As said before, the main purpose of this deck is to send your opponent's rear guards to the bottom deck, and this unit does it perfectly well. If this unit is boosted and it's attacking a Vanguard, the GB1 ability will let it CB1 to send a G2 or less RG to the bottom deck. Sounds good to me. Steam Knight Puzur Ili is another card with the silent tom effect, except you have to pay the cost of SB2 when attacking the Vanguard to activate the effect. Relic Master Dragon is a CB2 on call or on ride to send a G2 or less RG to bottom deck. It's quite CB heavy, like many other units in the deck, and that's why there's only 3. Apex Standing Gearwolf is a key card. Since this deck focuses so much on sending RGs to the bottom deck, why not power up because of it? This unit gains [Power]+3000 on the RC when an opponent's rear-guard is sent to bottom deck. Steam Rider Burnham is a 10K booster for the Vanguard, and it's a GB1 skill. Best to have this behind your Vanguard when it is at Chronos Command Dragon to make sure that thing hits. Lucky Pot Dracokid is a draw trigger with the Margal effect. You're gonna need this to fuel your soul for all the different card abilities your deck has. Timepiece Dracokid is a G3 searcher with no restrictions. Nuff' said. Overall, this deck is really fun to play but really CB heavy. You have to be careful not to spam all the skills when you play this deck or your deck will become vanilla once you hit late game.